The US government has announced that its military has successfully tested a new air defense missile which can shoot down medium-range ballistic missiles. 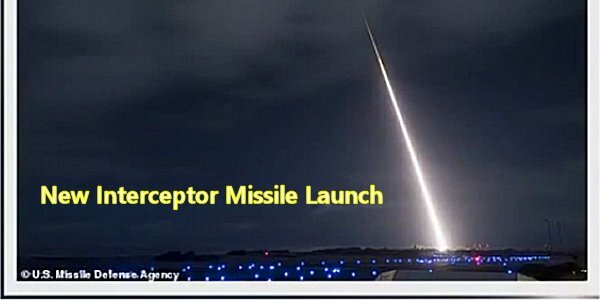 A US destroyer launched the interceptor missile which was able to impact the target ballistic missile and destroy it (first and second links). This successful test was very important as there have been previous tests failures as this new weapons system is being readied for deployment. This new missile is designed to work as part of the US Navy’s Aegis air defense system, and it can be fired both from naval warships and from any Aegis Ashore battery. It has been jointly developed by Raytheon, a US defense company and Mitsubishi Heavy Industries, its Japanese partner. Expect Japan to benefit from this new program as well. This is a very important development for many reasons. As readers no doubt know, North Korea has been dragging its feet about implementing the agreement North Korea’s leader signed with US President Trump in Singapore earlier this year to “denuclearize the Korean Peninsula.” The testing of this new US missile at this time may not be coincidental, for at least three reasons. The first reason is that North Korea has a number of ballistic missiles capable of carrying nuclear warheads. If both Japan and the USA are in the process of deploying a ballistic missile interceptor program, it limits the usefulness of North Korea’s ballistic missiles as it is increasingly evident that North Korean ballistic missiles fired from its territory could be shot down during their boost phase by either the US or Japanese military forces located in the vicinity of the Korean Peninsula. Hopefully, this will help motivate North Korea to actually implement a program to destroy its nuclear weapons. Secondly, it also sends a message to China. China aggressively militarized artificial islands in the South China Sea while the Obama administration looked the other way and did nothing. China has openly declared that it has developed ballistic missiles which can be fired at US carrier task forces as well as at fixed targets like the US military base at Guam. Of course, everything in the Japanese Home Islands would be within the range of this medium-range Chinese ballistic missile. That the US and Japan are nearing the deployment of this new interceptor missile in the Aegis air defense system means that there will be a credible deterrent to the new Chinese missile in both the US and Japanese arsenals. Both Japan and the USA have Aegis-equipped warships in the Western Pacific Rim region that can fire these new missiles, and Japan is building an Aegis Ashore missile installation on its soil which can also fire these new missiles at any incoming North Korean or Chinese ballistic missile. There is a third reason why this development is important. Russia has the ability to fire ballistic missiles at Europe from either its homeland or from its Kaliningrad enclave north of Poland. As I documented in a previous post, Romania already has an operational Aegis Ashore facility located on its soil, and Poland is in the process of bringing another Aegis Ashore facility to completion on Polish territory. The one in Poland could counter any Russian ballistic (or cruise) missiles fired from Kaliningrad at any NATO target. Russia also will surely realize that this new ballistic missile interceptor can be used against incoming Russian ballistic missiles fired from the US Aegis Ashore facilities in either Romania or Poland. Substantially negating a North Korean, Chinese or Russian ballistic missile capability is most useful in helping to deter any war from being started. The USA also has interceptor missiles to destroy incoming ICBMs fired at the American homeland, but not nearly enough of them have been deployed to counter an all-out attack by enemy ICBMs (third link). Allow me to suggest two alternative missile defense programs which may exist within the US military vs. ICBMs fired at the USA. Over 30 year ago during the Cold War, the USA had developed a system to fire missiles form high-flying warplanes to shoot down satellites in space (fourth link and fifth link), If the USA had the capacity to shoot down orbital satellites from US warplanes in the mid-1980s, how much further do you suppose this program has developed over the last three decades? I seriously doubt the Pentagon or DARPA forgot all about this space defense capability. Since ICBMs (of any range) have to go into space during the high point of their trajectory, modern warplanes equipped with missiles far more advanced than the 1980s anti-satellite missiles could have the capacity to shoot down incoming ballistic missiles as well. There is one more possibility, although it may sound like science fiction. There is a surfeit of cable-TV documentaries and programs that assert that there are UFOs which can “fly” through the atmosphere at incredible speeds and perform almost right-angle turns. Many such UFOs have been seen by very credible witnesses (airline pilots, military and law enforcement personnel, etc.). It is my opinion that the US Defense Department and DARPA have developed aerial vehicles which do not use traditional wings or methods of propulsion. Some UFOs make right-angle, high-speed course corrections that would normally kill a human being. Let us consider a possible alternative to “space alien” explanations for UFOs. Such radical course and speed maneuvers could be performed if no human beings were on those aerial vehicles. If they were remotely-piloted or if they were “crewed” by Artificial-Intelligence devices, then they could conduct the observed radical maneuvers they make without endangering any human beings. If the US Defense Department/DARPA has developed and deployed such aerial vehicles, who knows what offensive and defensive weaponry they may be able to deploy? An enemy might not know about their capabilities until the USA is actually attacked. The prophecy in Revelation 13:1-5 discusses the unveiling of a yet-future “beast” system which will dominate the world for 42 months before it is, itself, destroyed by the Second Coming of Jesus Christ who will set up a millennial utopia ruled by himself and his resurrected saints who will then be transformed into spirit beings who will act as subordinates to Jesus Christ in his kingdom (Revelation 19:11-20:5). Addressing the time when this prophesied beast system will be unveiled to the world, Revelation 13:4 foretells that the nations will marvel at what they see and say “Who is able to make war with him?” To make such a statement, it is obvious that this future world system will unveil previously-unknown weaponry that will militarily intimidate the nations. I believe such secret weapons systems already exist, and that they are simply awaiting the right time to be revealed in the future. For an in-depth examination of how biblical prophecies about the latter days have accurately foretold the circumstances of our modern world, please read my articles, Are We Living in the Biblical Latter Days?, Japan in Biblical Prophecy, The USA in Biblical Prophecy, and What Ezekiel 38-39 Reveals about a Future World War III.